Christmas won’t be the same this year for Meg, Jo, Beth, and Amy, as their father is away fighting in the Civil War and the family has fallen on hard times. But though they may be poor, life for the four March sisters is rich with color, as they play games, put on wild theatricals, make new friends, argue, grapple with their vices, learn from their mistakes, nurse each other through sickness and disappointments, and get into all sorts of trouble. Until I decided to read this for my challenge I had no idea that is was the first of a series of books. 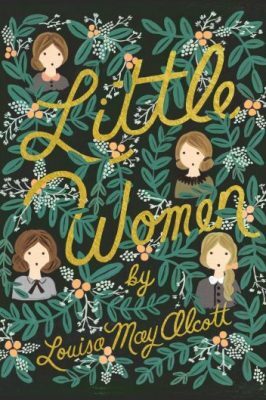 Most editions now have both Little Women and Good Wives combined but the edition I had was just the first part of the series. I thought I had read it years ago but I didn’t recognize any of the story so I guess not. The only things I knew were from the Friends episode where Joey reads it and Rachel reads The Shining. There is a scene where they spoil parts of the books for each other so the whole time I was waiting for Beth to die. She didn’t in the first part so I can assume she dies in the next book. I enjoyed this book enough, didn’t love it, didn’t hate it. I enjoyed the story and the characters (most of the time) but it just wasn’t that exciting to read. I do plan on reading the second part at some point, just to see how the girl’s stories end. I would give it a 3.5 rating.